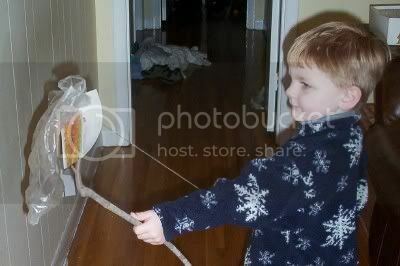 My son finally made the mechanical grabber he saw on Zoom, with string and stick we had on hand. Next time, how about making one sturdy enough to handle that pile of laundry in the background? Wow, great job! Do I detect a budding Edison in your family? I had envisioned us writing little plays and building marionettes a la Julie Andrews in The Sound of Music, but he's just not interested. This is what he likes, so this is what we do! Well, maybe he won't build marionettes...but I wouldn't be surprised if one day he finds a way to make them move without strings!